Fun fact: I spent 17 years and over $30,00o on three continents trying to de-gay myself. This failed sexual re-orientation odyssey including ex-gay support groups, exorcisms to drive out the demons of homosexuality, and a two-year stint in the notorious Love in Action gay conversion therapy camp in Memphis, TN. I lived to tell my tale (and to settle down in a delightful relationship with the man I love) and found that I needed humor to get a grip on the madness that nearly destroyed me. 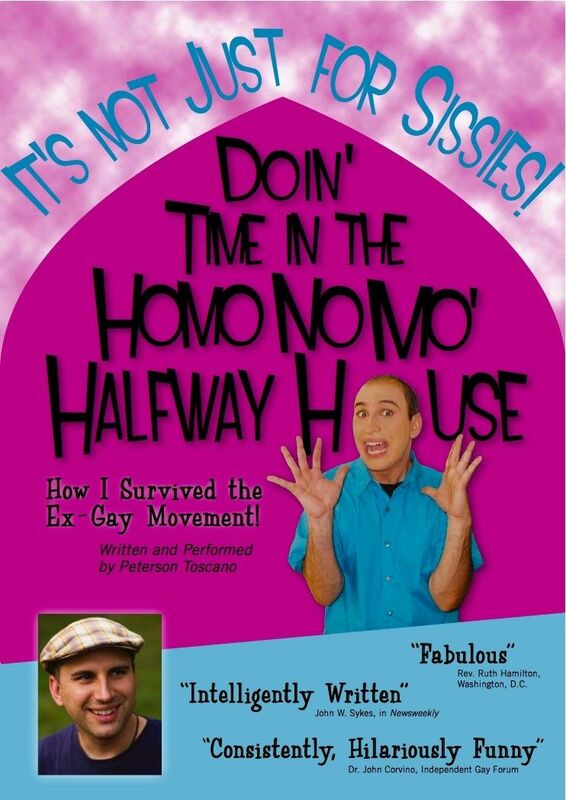 It’s been 12 years since I first sat down to write Doin’ Time in the Homo No Mo Halfway House. I do not perform the play any longer, but you can watch it for yourself. I play nine different characters and give you a personal tour of the Homo No Mo Halfway House. You will discover many things about this ex-gay boot camp, including why they can boldly declare: Yes, we have no bananas. « Climate Stew. Coming SOON!